The kit is sealed and was released in 1998. Each of the world-famous characters in the series is the end product of exhaustive CAD design, and the heroes are made with an eye to perfect accuracy and authenticity. Indeed, within about an hour – or at the most an evening – collectors can complete assembly of their action hero in a suitably dramatic pose. 200# Test boxes provide more strength and protection than a standard 32 ECT box – the light weight alternative. STEP 2: Bubble bag, poly bag or both! Then seal the item in a poly bag. We are polite, courteous and always eager to go the extra mile! 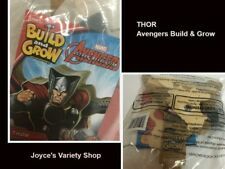 Lowe's Avengers Build & Grow THOR. Wood building kit. Communication is the key in avoiding any issues. 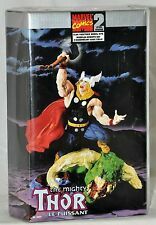 Item #48621, ToyBiz 1998. the mighty THOR. Marvel Comics. Model Kit Level 2. New Factory Sealed Box, VHTF. (3) Bobblehead function with display base. 1) Unique look and design on popular movie characters. Item The Mighty Thor. Paint and glue not included. Condition Box has been opened but pieces inside are still sealed. MARVEL AVENGERS MIGHTY THOR PAPER CRAFT DIE CUT 12 INCH POSEABLE FIGURE~NEW! They're poseable too! Collect 'em all! Ages 8 and up. 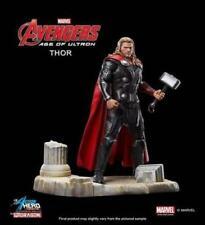 This is a 1/8 scale vinyl model of THOR ! DC Comics hero ! This is not from Bangkok ! Original Horizon kit that I built up myself and hand painted ! 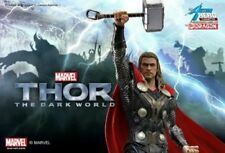 Own a piece of the Thor: The Dark World movie! 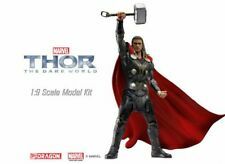 Developed in 3-D using official data from Marvel, this pre-painted Thor The Dark World 1:9 Scale AHV Pre-Assembled Model Kit is exceptionally detailed and accurate, and is capable of taking dynamic poses on its diorama base. 3D Laser Cut Models. From steel sheet to museum Quality 3D Models. Simply pop out the pieces and connect using tabs and holes. Difficulty: Moderate. Number of sheets: 2 Sheets. Experience the fun of model building with the exciting characters of the Marvel Universe! Condition: New in Box - Never Opened. Ages 8 and up. ACTION HERO VIGNETTE. THOR THE DARK WORLD . NO GLUE OR MODELING SKILL REQUIRED. The use of model kit techniques allow us reproduce the intricate details and sharp lines to maximize the usage of the official 3D character scans. Each model is accurate down to the most minuscule details. A complete tool kit that includes two pairs of pliers and a clipper is availablehere. We apologize for the inconvenience. If you’re looking for further detail, you might want to check the manufacturer or publisher website. Each model is accurate down to the most minuscule details. We apologize for the inconvenience. A complete tool kit that includes two pairs of pliers and a clipper is availablehere. If you’re looking for further detail, you might want to check the manufacturer or publisher website. Kit No Build No Paint No Cards. Model Kit is Unpainted and Unassembled. Have not been used, installed, or disassembled. Very heavy! Smoother surface. Two screws under the handle. Act fast on this one! Fantastic Piece.